Whether you are just starting your career at Kenton City Schools or a seasoned veteran, this document is for you. It gives you an overview of the technology available at Kenton City Schools and procedures for technology use and support. Quick and timely support can be yours with the KCS Technology Help Desk. Located at https://kcstech.freshdesk.com/, the help desk is a place for support documents, how-tos, and a place to submit help requests. The help desk is the quickest way to notify the tech department of issues. The technology department uses Twitter to send out text alerts when there are issues affecting a building or the district. Don’t worry, you don’t have to have a Twitter account, and these alerts work with any cellular device that can receive text messages. Tech Alerts – Technology outages and other information. Other alerts – Delays, cancellations, etc. 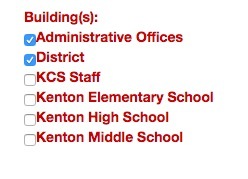 Your MyCatPage is a start page to the sites and services that you will need to use at Kenton City Schools. One important link from your MyCatPage is the Personal Info tab. The district email lists for the individual builds is updated by what buildings you have checked on your Personal Info page. Be sure to check the building or buildings in which you are currently working. The technology department website is located at https://tech.kentoncityschools.org. On the website, you will find technology news, help sheets, and other links that are helpful for the staff and students of Kenton City Schools. Each teacher has a sub account. This account can be used by your substitute teacher when you are absent from the classroom. The sub account is a Google account, and as such, you can share documents with the account and your substitute teacher will have access to the documents. You can also use email to communicate with your substitute teacher. I’ve created a document that you can use in your sub plans to provide information for the substitute teacher. Make a copy of the Sub Account document and modify it to your liking. at the very least you’ll want to put in the username and password of the sub account. Kenton City Schools was one of the first school districts in the country that sign up with G Suite for Education. Google has become very ingrained in the learning and teaching that goes on in the district. Here are a few of the Google products in use and initial tips on using the product. All staff and students have a Google account, in the form of their email address and a password given to them. Google Chrome is the most used browser at Kenton City Schools. One big advantage of using Google Chrome is the ability to sign in with your Google. The first time Google Chrome launches it will ask you to sign in, but if you haven’t, you can access the sign in page through the chrome://chrome-signin url (you’ll need to copy and paste the link for it to work). By signing in, bookmarks, usernames and passwords, and printers will automatically be synced. Kenton City Schools uses Gmail for email. It is very powerful, especially when it comes to searches. For your mobile device I would recommend installing the office GMail app. Google Drive is the main location for all of your files. From the web, you can access your files at https://drive.google.com/, on your laptop you can sync a Google Drive folder, which will back up anything in the Google Drive folder on your laptop to Google Drive at Google. This means, on your laptop, you must sign in to the Google Drive app and sync your files if you want to back up your laptop. Only items in the Google Drive app will be backed up. Google Drive is also the office suite used at Kenton City Schools, consisted of Google Docs for word processing, Google Slides for presentations, and Google Sheets for spreadsheets. All of these applications support online, collaborative editing. Finally, Google Drive excels at sharing files and folders with others. Anytime you need to share an item with someone else, you’ll want to use Google Drive. This is especially true if the item is large. Google Groups is the Google name for email listservs, a way to email or collaborate with a group of email. Every class in Gradebook has a Google Group created. The name of the group is based on your teacher code in Student Information, a four letter code based on your last name and first name. It is usually the first three letters of the last name and the first initial. To check your class groups, visit your Google Groups page. On that page you can also verify the participants in each list. There is one group that contains all of your students, TEACHERCODE@kentoncityschools.org, and a group for each period, such as TEACHERCODE-01@kentoncityschools.org for your first period class. Other groups are listed at https://tech.kentoncityschools.org/manual/email-groups/. Everyone automatically gets a personal Google calendar created, and you can add district wide calendars to your list. To get started, check out the page on adding calendars. There are several LMSes (Learning Management Systems) available at Kenton City Schools. Almost all printing at Kenton City Schools happens to the district copiers. These copiers are automatically set up for you to use on your laptops or through Google Chrome. The copiers can also be used to scan in documents to the computer. There is a help sheet available to get you started. Each certified staff member is assigned a Macbook Air, video dongle, and power adapter. Before the laptop is assigned, the certified staff member must complete the OS X and Mac Laptop Training online course. This course will explain the different parts of the Macbook and gives tips on Macbook use. An important part of the training is setting up the Google Drive applicaiton on the Macbook. This app will back up local files and folders to Google in case something happens to your Macbook. It is imperative that you have Google Drive set up and that your files and folders are in your Google Drive folder. There is a video in the online course to help you set up the Google Drive application. IF YOU HAVE NOT SET UP GOOGLE DRIVE ON YOUR LAPTOP, YOU WILL LOSE FILES! USING THE GOOGLE DRIVE APP WILL NOT CONVERT FILES TO GOOGLE DOCS (or GOOGLE SHEETS, etc.). ANY FILE OR FOLDER ON YOUR DESKTOP OR IN YOUR DOCUMENTS FOLDER IS AT RISK.